Given the wide range of departments, roles, and services that the medical profession covers, it’s no surprise that lone workers play a vital role in delivering many of the services on offer. Ambulance personnel, community health providers, social workers, carers, technicians, out of hours care and security personnel are just some of the typical roles which will frequently require staff to work on their own in a medical environment, without the supervision of colleagues. Furthermore, with medical establishments typically occupying vast areas made up of multiple buildings, not to mention the community work that goes on, it is vital that medical staff can communicate effectively with colleagues to ensure optimum service levels and to keep them safe at all times. Safety is paramount within the medical profession, not just to protect the health and safety of patients but also the staff and visitors. As with many professions that employ lone workers, there are numerous examples of hazards that employees could face on a daily basis. 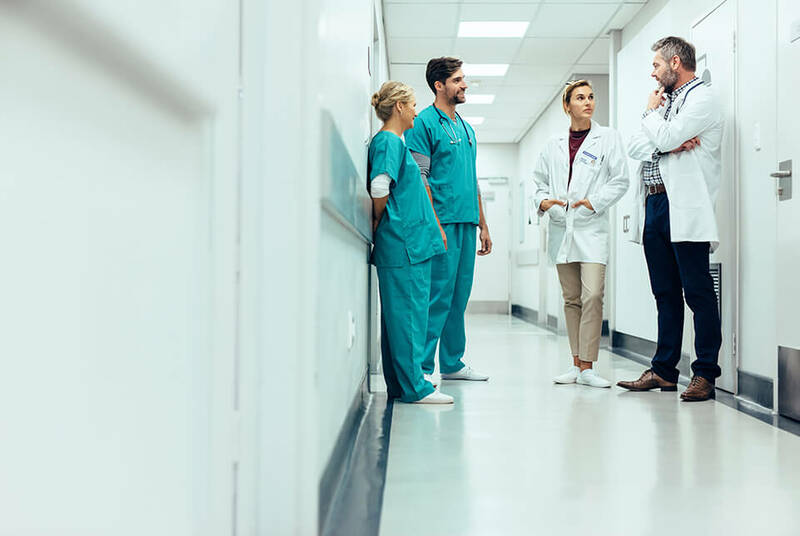 Even though many hospital staff will deal with the general public frequently throughout the work day, many will have regular moments where they are required to work alone. Furthermore, a majority of hospital staff operate appointments on a one-to-one basis without the supervision of colleagues, exposing them to the threats of lone working, such as attacks or verbal abuse from patients. However, regardless of whether an employee’s main role is to work with patients or not, there are still significant lone working hazards they could face, such as a trip, fall, or sudden onset of illness. One particular example that has hit the headlines recently is the shocking amount of violence that is directed towards NHS ambulance staff – in recent times, calls that would previously received a joint response are now routinely attended by ambulance staff alone. Research from GMB, the union for ambulance workers, found that 72% of ambulance staff have been attacked while on duty and in 2016 to 2017, recorded attacks averaged more than eight per day – that’s a 34% increase in just four years. These are staggering statistics that highlight the increasing levels of abuse ambulance staff are experiencing from the public they are sworn to protect. As lone working becomes more prevalent and NHS budgets are tightened, the potential for violent incidents against staff can increase. As with the medical profession itself, any emergency must be responded to swiftly and effectively to avoid potentially devastating consequences. Therefore, staff must have access to communication devices where they can quickly call for help in the event of an emergency at any time. From the front line all the way throughout the medical profession, every staff member can benefit from having access to a communication device with lone worker functionality. Moreover, given the vast number of different roles, each position may require a different device format that is ideally suited to the working environment. For example, alarm apps can be integrated into smartphones, but an ambulance worker could benefit more from a simpler device where an alarm is immediately activated from the push of a single button. The use of tilt sensors can also be effective, whereby the device detects if a person is horizontal, or past a pre-determined angle, for a specific length of time and can automatically raise the alarm on behalf of the person in potential peril. Whilst these devices are vital in safeguarding the lives of lone workers, equally it’s crucial that each individual undergoes regular training to fully understand how to use the devices and ensure that safety procedures are correctly adhered to in the event of an emergency. Combining innovative lone working devices with adequate training will not only help staff to call for help in the event of an emergency, but also provide peace of mind that even though the employee may be working on their own, they can call for backup at any time.